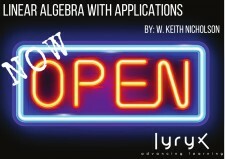 Lyryx announces the release of "Linear Algebra with Applications" (W. Keith Nicholson) as their latest open educational resource (OER). CALGARY, Alberta, January 8, 2018	(Newswire.com) - Today marks the official release of the latest open educational resource (OER) from Lyryx Learning. 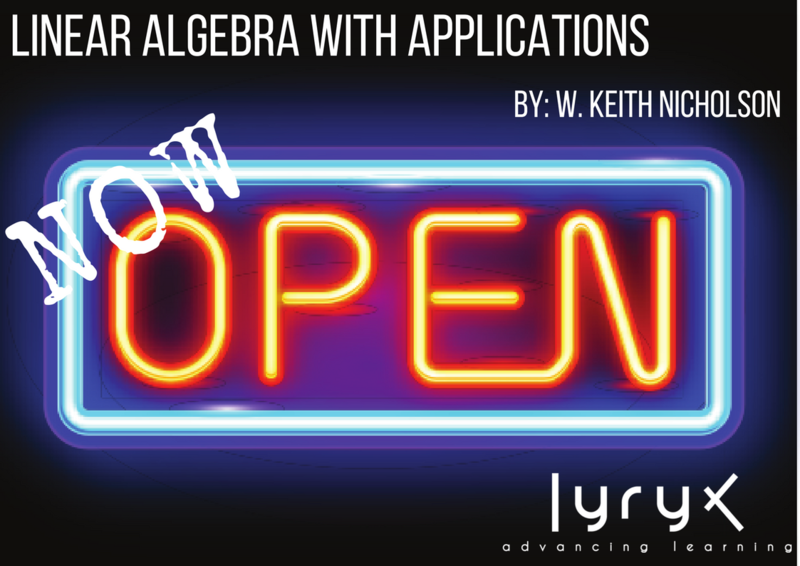 W. Keith Nicholson’s Linear Algebra with Applications, a text published for many years by a traditional publisher, has now been released with an open license and is freely available to all. OERs are educational materials that are open, freely accessible and can be fully used, shared, and adapted in the digital environment. Lyryx Learning is an open educational resources (OER) company based in Calgary, Alberta that began in the Mathematics Department at the University of Calgary. Lyryx was established in 2000 and is supporting instructors across Canada by sustaining OER and developing adaptable, accessible and affordable resources for higher education. Lyryx provides quality OER and services including open texts, assessments, supplements and support in the subjects of Mathematics, Statistics, Accounting and Economics. Lyryx provides all open educational resources (OER) and services required to complement your course instruction including open texts, assessments, supplements and support in the subjects of: Mathematics, Statistics, Accounting and Economics. Lyryx Learning Inc. is helping to reduce educational costs for students by providing free open textbooks and affordable online homework. Lyryx reports substantial savings for post-secondary students enrolled in courses using open educational resources (OER).